” “Sin” has been disappearing for a while. American psychiatrist Karl Menninger (a non-believer) wrote in 1973 in Whatever Happened to Sin? that the word was rarely heard. “Does that mean that no sin is involved in all our troubles – sin with an ‘I’ in the middle? Is no one any longer guilty of anything? Guilty perhaps of a sin that could be repented and repaired or atoned for? Is it only that someone may be stupid or sick or criminal – or asleep? This trend has accelerated. Look at celebrities who get into trouble and have to apologise. Perish the thought that they were callous, brutal, treacherous, selfish, insensitive, self-indulgent or greedy – they “made a mistake”. It is a phrase emptied of moral content by comparison with the alternatives. A mistake is when you take the wrong turn while driving; keeping on until you have overrun Poland is not a “mistake”. Thus The Birds has a counter cultural message which speaks clearly to our society which is obsessed with rights over responsibility and victim-hood over moral accountability. The brokenness and hurt within us causes us to in turn hurt others. In one scene in the film, Hitchcock has a group of children playing blind-man’s bluff, this was deliberately inserted by the director as a metaphor for how we humans blindly injure others with our own dysfunctions. We are all responsible for our actions, if modern science has taught us anything, it is that we live in a symbiotic universe, in which every action affects our environment. The end shot of the birds is of Melanie and Mitch’s family slowly driving away from their home which is now overrun with Birds. 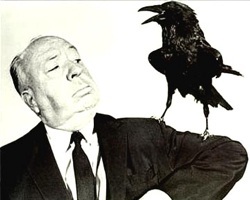 Hitchcock deliberately had no “The End’ appear at the conclusion of his film, it is a frighteningly shocking message, that left unchecked the unredeemed human will has the potential to overrun creation. Hitchcock’s creatively retells the message of Genesis and the fall. We cannot simply divide the world into good and bad camps, we are all responsible for wrong in the world. The ending of the BIrds is quite nhillistic, however the end of history as told by the Bible paints a world freed from the destruction caused by human sin and brokeness.